The print version of the Encyclopedia Judaica is the Reference collection on the first floor of the library, near the student computers. The call number is DS102.8 .E52 2007. 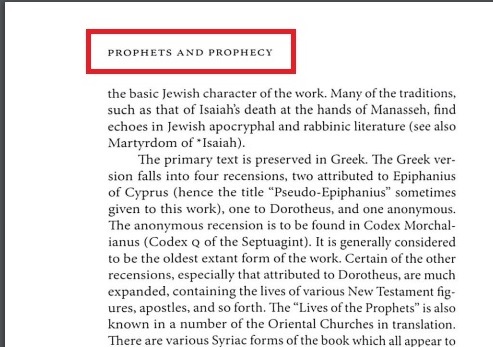 Look for the volume (individual book) that has the section where the word "prophet" would fall alphabetically (it's v. 16. Pes-Qu ), and look for the article entry title in bold on the top corner of each page. It's alphabetical, so flip through the pages to find the entry for Prophet.